A fair warning in advance. It was not one of my better days. We met outside the main arrival hall of Schiphol in a small cafe where you could sit outside. Cor, Atie's husband, was so kind to order some coffee and apple pie, but I couldn't get anything in my stomach because of all the butterflies occupying it. I faced a crisis or two in my life without so much of the blink of eye, but picking up my puppy simply had turned an otherwise grown-up man into a mess. It wasn't because I hadn't triple-checked all the rules for international travel in advance, with Atie's help. There was a lot of detail to take into account, a lot of preparation and paperwork, but I was prepared. 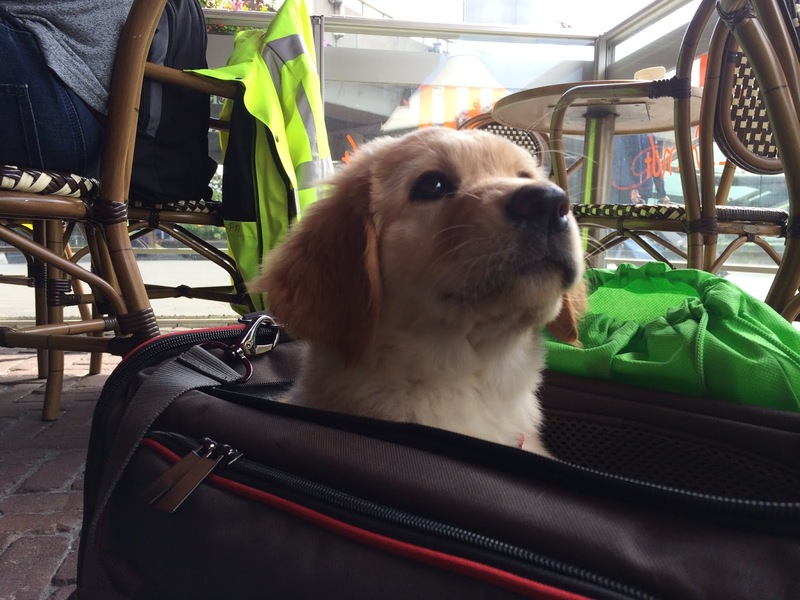 I was allowed to fly with an 8-week puppy in the cabin without rabies vaccinations, from Holland to Denmark. I had all the signatures and stamps needed. But when travel day came, I felt anxious nonetheless, I knew just one mistake on one of the many forms for all the authorities could ruin the whole trip. People were kind to give advice and I received many good tips in the days up to travel day. One tip in particular would turn out to be a life-saver. When Zerline and me checked-in the flight-attendant totally unexpectedly asked for Zerline's rabies vaccinations. I was surprised I had to inform her rabies shots are not required when you travel with a 8-week old puppy. At least, when you travel from Holland to Denmark. The flight-attendant started to look at her computer screen, browsing through some kind of rule book, while looking bored. "I can look them up for you. ", I offered, and showed her a copy of the rules I kept on my smartphone. It made her uncomfortable, and she returned to browsing on the computer, while repeating herself a couple of times, "Well, it doesn't say here. So..."
It didn't sound good. I thought about asking for her supervisor when I remembered Maria's tip. Maria is an experienced Hovawart breeder and had traveled with many puppies abroad. "When in doubt about her weight or anything, just get your puppy out of the crate and give it to the flight-attendant, they will solve any issue for you." I quickly took Zerline out of her travel-bag and waved 8 kilos of furry blond cuteness in front of the flight-attendant, who instantly started to melt and folded her hands below her chin. "Awww!" 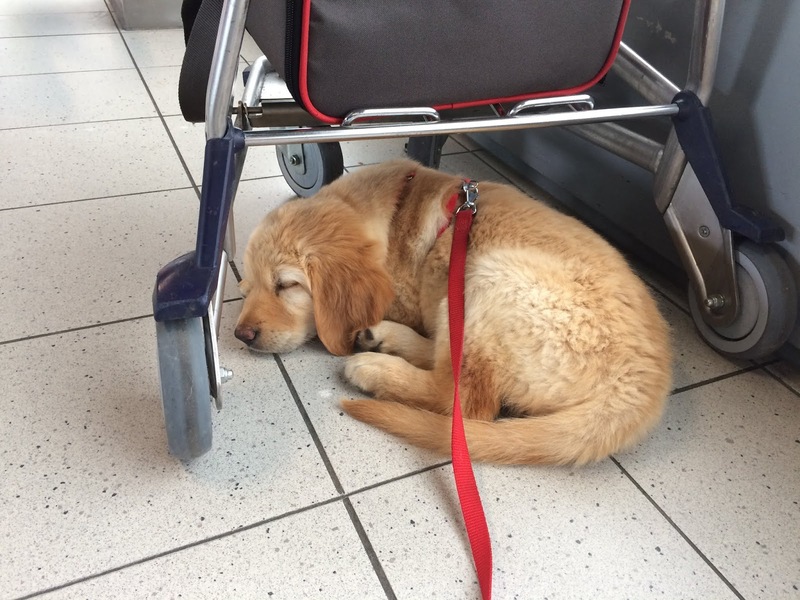 Her exclamation of delight and the cute puppy on top of the check-in desk attracted the other flight-attendants sitting on the desks next to her and they all wanted to touch the puppy. "What's wrong?" one flight-attendant asked to another. She told what I claimed about the rules and now all three flight-attendants were browsing the screen to find the rule they needed. If they did find it, I will never know but suddenly the printer rattled, and two boarding cards came out. I decided not to ask. Off we went, while thanking Maria for her excellent tip. We passed security, after an obligatory laugh about their "we have to confiscate the puppy" joke. Now there was only one hurdle left. I bought the travel-bag sized for another airline. But the ticket sale bounced at the last moment because HQ had a minimum age of 12 weeks, not known to their local Danish office. The travel-bag was too big for the airline I switched to. I kept the bag nonetheless, and measured if it would fit when I flew in to Holland. If it wouldn't fit, I had ample time to buy a new one in Amsterdam I thought. But it didn't seem necessary, the travel-bag fitted under the seat. When the boarding call was made I looked out of the window to the docking area. I couldn't see any plane to board. That was odd. First when I stood up and joined the boarding line I could see the plane, looking down. Gosh it was tiny. I traveled this route with this airline more times than I can count. Never did I see them use such a small airplane. This was definitely another plane type. A slight feeling of panic was creeping up on me when I entered the plane. It really was tiny, I couldn't even stand upraised and everything was cramped. I worried if the travel-bag would fit at all. I just placed the travel bag on the floor and my feet casually into the aisle, while cursing those long legs and my stupidity to know better than the airlines. It just took a couple of seconds until the first flight-attendant came knocking. She held a small piece of paper in her hand and asked while giving me that typical flight-attendant smile, who was traveling with a puppy. "That would be...", she didn't let me finish. "This will not work, in case of an emergency it blocks your neighbor", she said while pointing at the travel bag. Me and my neighbor exchanged a quick look, but before any of us could answer, "Let me see what can be done", the flight-attendant said, and off she went. She didn't even leave me enough time to pull the puppy trick. I doubt it would have helped. While the plane was filling up, I was busy cursing at myself for my mistake. No way Zerline was going in cargo, I thought. It would be better if we got thrown off the plane I guessed. When the airplane door was closed and boarding seemed finished, the flight-attendant returned and I braced myself for what was about to happen. "Can you come with me", she said surprisingly not to me, but to my neighbor. My eyes followed him with a feeling of guilt while he walked to the front of the plane. I was spoiling his trip I thought, until I saw the flight-attendant placed him in first class. I didn't expect that. The flight-attendant was returning to me now and I was confused, what did she have in mind, does this have a happy ending? While she passed by me, she laid her hand on my shoulder and whispered in my ear, "Now you have more space together. Have a good flight."